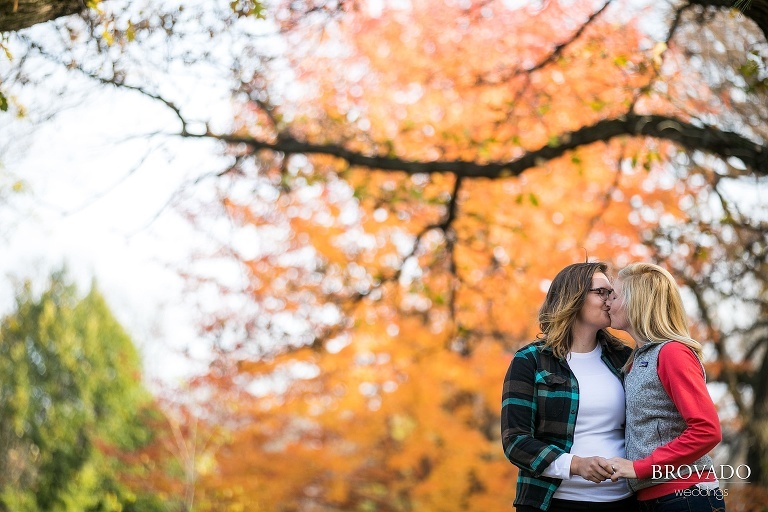 There are so many things that I love about Nina and Karen—their engagement story, future wedding plans, and relationship as a whole to start. But there are three specific things about them that really stuck out to me. Number one (the most important) is that they are head over heels for each other, and you can tell in a really genuine way. Witnessing and documenting a connection as real as theirs never gets old to me. Number two, they are just so themselves with each other and in front of the camera. It’s beautiful to take a photo, look at it, and be able to see a person as they truly are. This is exactly what happened with both Nina and Karen, except you’re able to see their relationships as it truly is, too. Which is really beautiful. Finally, these two are adventurous. They were down to sit, climb, or wander throughout all the gorgeous spots Minnehaha Falls has to offer. They even waded into the river as our photo shoot came to a close. The photos we captured there, with them standing in the rushing water, are some of my favorite Minnehaha photos to date. And I’ve taken a lot of photos at Minnehaha Falls. To top it all off, next September Nina and Karen are getting married up north in Lutsen, Minnesota. And on the morning of their special day, they have planned a sunrise kayaking photo shoot. How cool is that? Congratulations again Nina and Karen! Thanks for reminding me the unbelievable beauty the outdoors has to offer, no matter what the season, and the power of adventure. You both are great. I’m already excited for September!